Talk about value-pricing makes me crabby. It’s not that I’m a fan of the billable hour or that I fear that flat fees (one type of alternative pricing) put lawyers at risk of under-recovery. Rather, it’s just that many of the alternative/value-pricing gurus are so darn opaque about how to implement alternative pricing that the entire alternative billing practice seems just a little fishy; an elaborate cover for just pulling prices out of a hat. Of course, I know that alternative pricing isn’t a shell game. And as luck would have it, a lobster — or more accurately, a Harvard Business Review blog post, Pricing Lessons from New England’s Lobster Glut by Rafi Mohammed — put me out of my crabby mood with a concise explanation of how value pricing works. Mohammed observes that even though lobster prices at the dock have reached all time lows of under $2.00/pound, consumers aren’t necessarily paying less. While grocery store prices for lobster have dipped to around $3.99 per pound and a few restaurants have reduced the price for lobster dinners, Mohammed writes that prices haven’t changed at his favorite fancy restaurant (where a lobster roll is close to $30) or for “picked” lobster (removed from the bone). When you are buying a product, do you evaluate prices with a dictum that they can’t be more than 50% of what it costs to manufacture? The key to better pricing is to capture the value of your product relative to your customers’ next best alternatives. If your product is exactly identical to customers’ next best alternatives, your prices have to be the same. Why would customers pay more? However, if your product is better, there is an opportunity to charge a premium over rivals’ prices. Conversely, if your product is worse, you have to offer an incentive — a discount — to get customers to buy. In the world of lobster, the products sold by grocery stores and restaurants in Chinatown are pretty much the same. Because the products are identical, the prices have to be the same – which means that as one store or restaurant lowers prices, others are forced to do it as well. By contrast, the premium restaurant or “picked meat” provide unique value in preparation (and also cater to less price sensitive customers). Consequently, they don’t have to lower their prices, even in a glut to remain competitive. The analogies to legal fee setting should be self-evident. The problem with hourly billing is the same as the problem with strict cost-plus pricing: ways to implement but no correlation between what customers will pay. Just as customers don’t care if a business consistently earns a 50 percent profit margin, clients also don’t care whether a DUI case takes 1 hour or 15 hours; they just want to be cleared of the charges. Likewise, when you offer the same product as everyone else, you have no choice but to charge the same for it. That’s the problem with commoditizing legal services: once they become fungible and indistinguishable from what 30 other firms offer, the only issue left is how much those services cost. So what do you provide your clients that others don’t? Maybe you make their lives easier by making housecalls or filling in forms whereas your competitors don’t. Maybe you return phone calls promptly, or limit your caseload to a certain number of cases to ensure more personalized service. 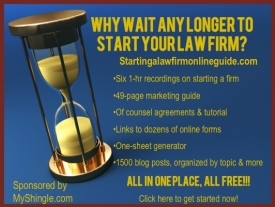 Maybe you call former clients every few months just to touch base or say hello or give them books and free information on how the legal process works or guarantee 24-hour service. However small those extras are, they add value for clients and clients who appreciate that value will pay for it.